Shackled and packed beneath the deck of a Portuguese slave ship, more than 400 Mozambican men and women left their homeland on Dec. 3, 1794. They were bound for Brazil, as fuel for the nation's growing sugar economy, and a test case for a new supply line in the trans-Atlantic slave trade: East Africa. Two days after Christmas, winds rocked the vessel—the São José-Paquete de Africa— as it rounded the Cape of Good Hope. The ship struck submerged rocks and wrecked between two reefs about 110 yards from the coast of South Africa. The captain and crew made it to shore, as well as some 200 slaves, who were saved only from immediate peril; they would be resold in the Western Cape. The others perished in the sea. For more than two centuries, the captain's deposition was the only account of the São José and its victims that prevailed above water. Now, more than 220 years later, an international team of researchers has resurfaced the story. The team made headlines around the globe in June when it unveiled two artifacts from the shipwreck at a news conference in South Africa. Researchers presented iron bars of ballast used to balance the ship (since the weight of human cargo could fluctuate) and a wooden pulley block. Both will be loaned to the Smithsonian's National Museum of African American History and Culture for an exhibition set to open next year. The findings will bring the public face to face with a chilling past that bridged continents and still divides communities. They will also help tell the slave-trade narrative from another perspective, says marine archaeologist Stephen Lubkemann, a GW anthropology and international affairs professor, who co-leads the research team that uncovered the items. "It is, in the most literal sense, as close as we will ever get to the experience of the Middle Passage," he says, referring to the slaving leg of a trade route that sent European ships to Africa, the New World and back to Europe. "The slave trade is one of the most important stories in modern history. It's a social process that has had ramifying impacts across the globe." The four centuries of the African slave trade left behind the wreckage of 590 documented slave ships. Yet, material evidence has been collected from only four of these sites, mostly by treasure hunters who recovered the relics without care or organization. Moreover, not one of these wrecks involved a vessel in the actual slaving leg of the trade. The São José excavation represents the first time archaeological evidence has been retrieved from a slave ship that went down with captives aboard, according to the researchers. 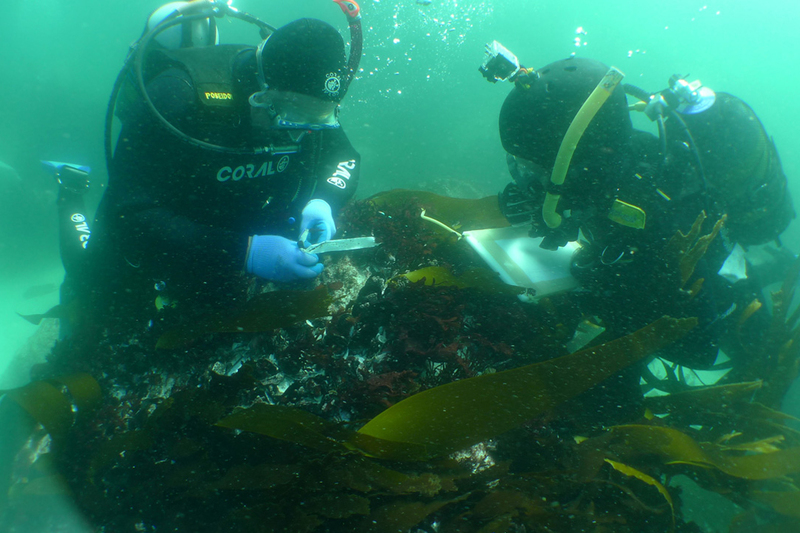 The discovery is a result of the Slave Wrecks Project—an ongoing collaboration between GW, the National Museum of African American History and Culture, the Iziko Museums of South Africa and other partners, including the U.S. National Park Service, the South African Heritage Resources Agency and Diving With a Purpose. Dr. Lubkemann leads the Slave Wrecks Project and co-directs the São José research with Jaco Boshoff of Iziko. The project connects historians, archaeologists and students under a mission of locating, documenting and preserving artifacts from the global slave trade, says Paul Gardullo, PhD '06, a historian and curator at the Smithsonian's African American history museum. "Part of the project is not just looking for individual wrecks, but helping to catalyze a field," he says. "We are trying to invest a sense of importance for these stories to be told in all parts of the world by different institutions." 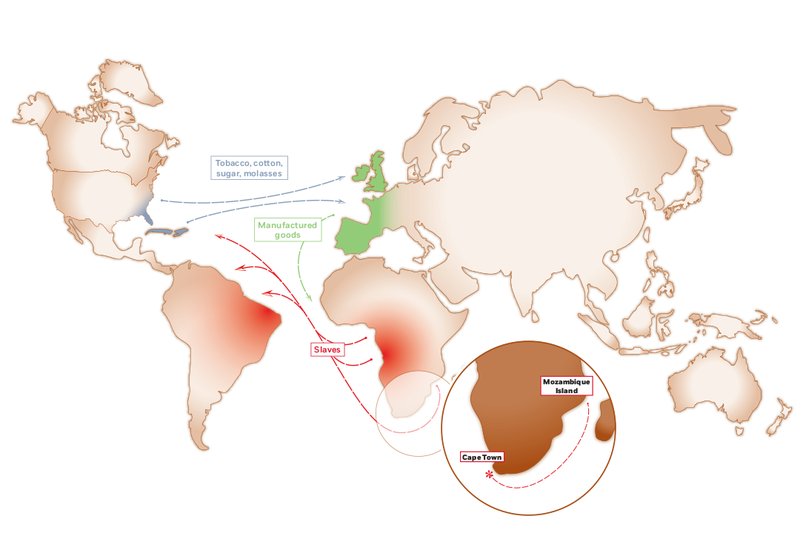 The São José site is one of many on the team's research agenda; fieldwork is ongoing in Senegal, South Africa, the Virgin Islands, Mozambique, Cuba and Brazil. Eventually the researchers hope to uncover artifacts from each of the major maritime slave routes, including the East African, trans-Atlantic and internal American slave trade. They are searching not only underwater but also on land—in places like Brazil and South Africa— where they will trace the origins and final destinations of the enslaved people who survived the Middle Passage. "We are just at the beginning," Dr. Gardullo says. The trans-Atlantic slave trade shipped an estimated 12.5 million people from Africa to the New World between 1525 and 1866. During the first stage of the so-called triangular trade route, slave ships from Britain carried manufactured goods, like cloth and guns, to trade for men, women and children in Africa. The enslaved Africans then endured a brutal journey to the Americas, where slaves were sold and sent to work on plantations. The ships completed the journey by transporting sugar, coffee and tobacco back to Europe. Lonnie G. Bunch III was on a mission in 2005. As the founding director of the National Museum of African American History and Culture, which will open on the National Mall next year, he hoped the new space would include remains of a slave ship. "Part of the reason why I wanted something from a single ship is that I wanted to humanize the slave trade. Most of us think of the millions of people brought over, but that almost blunts the rough edges," Mr. Bunch says. That goal would lead him and Dr. Gardullo on a four-year hunt filled with dead ends and disappointment. "I thought there had to be pieces in museums. I called institutions in England, in Stockholm, in France, in Portugal, and basically came up empty," Mr. Bunch says. "That's when I realized most of the slave ships are underwater." So the historian changed directions. He learned about a potential slave ship—yet to be excavated—that left Rhode Island in the 1790s, picked up Africans in Ghana and sank off the coast of Cuba during its return. But after a few years of research and negotiations that seemed to be going nowhere, he abandoned the idea. Then, fortune struck when Dr. Gardullo met GW's Dr. Lubkemann in 2009. Dr. Lubkemann told Dr. Gardullo about what was, at the time, a smaller effort called the South African Slave Wrecks Project, which he was leading with Dr. Boshoff from the Iziko Museum in Cape Town. That project had begun a few years earlier when new interest developed around the São José. Treasure hunters discovered a trio of cannons at the site in the 1980s while diving near Camps Bay, an affluent Cape Town suburb. They believed the wreckage to be a Dutch vessel that sank in 1756. But new archaeological evidence suggested otherwise: Dr. Boshoff, Dr. Lubkemann and a team of divers had uncovered copper fastenings and sheathing at the site. These materials were not commonly used on ships until later in the 18th century. Intrigued, the researchers began searching through archival records, hoping to find clues about the identity of the ship. In 2011, they hit the jackpot: a captain's account of the 1794 wrecking of the São José. The document led the archaeologists to Portugal, Brazil and South Africa, where they continued to sift through paperwork. The following year, they discovered the São José's manifest, which detailed its departure from Lisbon in 1794. The manifest included documentation that the São José had left Lisbon with 1,500 iron blocks of ballast—a small note that would soon reveal itself as an important clue. Archival "references provide you with ways to narrow down the search," Dr. Lubkemann says. "But then as you start to work on the site, you find artifacts that confirm you are on the site that you think you are." It can be a long, difficult process. And recovering objects from the depths of the ocean has its own challenges. The waters off the coast of Cape Town are cold and unpredictable. Storm surges batter the shore. Currents from Antarctica can create waves that are three stories high. At times, four-week archaeological expeditions are cut to a single day due to winds and low temperatures. "It's like diving into a washing machine," Dr. Lubkemann says. "This is one of the hardest sites I've ever worked on." At some shipwreck sites, divers also face the challenge of searching through waters where many ships have wrecked in the same place, known as "ship traps." "You have to identify one ship among many," Dr. Lubkemann says. And while people tend to think of shipwrecks as fading hulks, like the Titanic, he says, far less remains of most vessels. Since the São José wrecked so close to shore, much of its remains likely washed up on to the beach and eventually deteriorated. The rest of the ship is buried underwater, beneath more than 10 feet of sand. Once researchers locate a potential archaeological site, they use a magnetometer (a sort of glorified metal detector) to search for hidden treasures. "Imagine taking a really big puzzle and sticking it into a blender. Then take half of the pieces out, throw what is left into a bucket and cover it with sand," Dr. Lubkemann says. "We still don't know how much of the puzzle is out there." In 2012, the archaeologists uncovered a key piece of that puzzle. 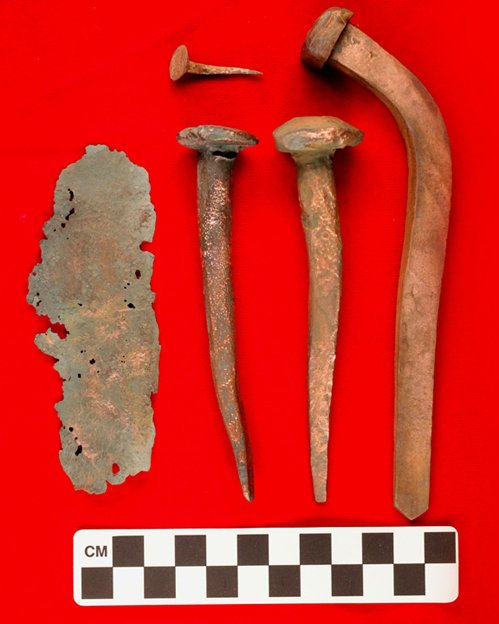 The excavation of the iron ballast, which matched the items listed in the São José manifest, was the utmost confirmation of the shipwreck site. For Dr. Lubkemann, the discovery was also a somber reminder of the callousness of the slave trade. 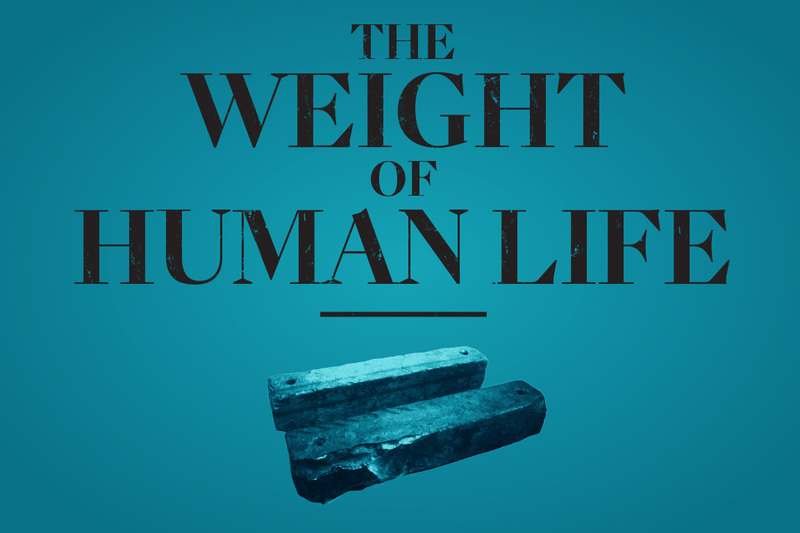 "The iron ballast literally stands in for the weight of people's bodies," he says. "These pieces, as unremarkable and plain as they may be, are profoundly symbolic in a way that is incomparable to anything else—how people were reduced to commodities." The iron bars and other newly found relics contribute essential knowledge to the field, at least as important as what is written in captains' logs and even slave narratives, which were published by European and American presses, he adds. "The historical record tells a story of those who have the ability to write, which is usually people in power. And it's heavily managed. It certainly doesn't reflect the experience of those who didn't have a voice," Dr. Lubkemann says. "That's where archaeology steps in and provides a different perspective that may, in certain instances, be quite different from that of what's been written." Meanwhile, back in Washington, Mr. Bunch waited hopefully for the researchers to confirm their discoveries. "I felt like a train, saying, ‘I think it's it, I think it's it,' But I wasn't sure," he says. "Then once Jaco [Boshoff] says he was convinced, I was elated." Beyond their scholarly significance, the items from the São José, Mr. Bunch says, promise to offer museum visitors a personal entry point to a historical event that is massive in scope and scale. At the museum, the ballast, the wooden pulley and other items still undergoing restoration—among them, possible shackles—will be displayed in a dark, triangular room, and soon will be joined, Mr. Bunch hopes, with new finds. "What you hope is that anyone who goes through this exhibit will be changed, that they'll understand that the slave trade is not a black story; it's a global story," he says. "It's a great educational opportunity to help us wrestle with elements of race that have divided this country." In June, Dr. Lubkemann, Mr. Bunch and Dr. Gardullo traveled to Mozambique, en route to Cape Town, where they planned to announce the findings from the São José site and hold a memorial service for the shipwreck's victims. Though the former Portuguese trading post still bears architectural reminders of foreign rule and African exploitation, slavery is not a topic readily discussed in Mozambique. For its people, the nation's history is fraught with complicated memories that have cast a long shadow. "The trade within the coast of Mozambique involves Africans who were buying and selling other Africans," Dr. Gardullo says. "That is sometimes a difficult history to face." During the visit, members of the Makua tribe—the largest ethnic group in the country— greeted the trio. Together they walked along the same path that hundreds of Makua people would have taken before boarding slave ships during the 18th century. "You felt how it must have felt, walking down this ramp, stumbling in chains, trying to figure out what's going on," Mr. Bunch says. The chiefs of the tribe then handed Mr. Bunch a small, lidded container decorated in white cowrie shells. A traditional symbol of wealth and power, the shells were often used as currency to buy slaves. Inside the container, a Makua chief placed soil from the coast of Mozambique. He charged Mr. 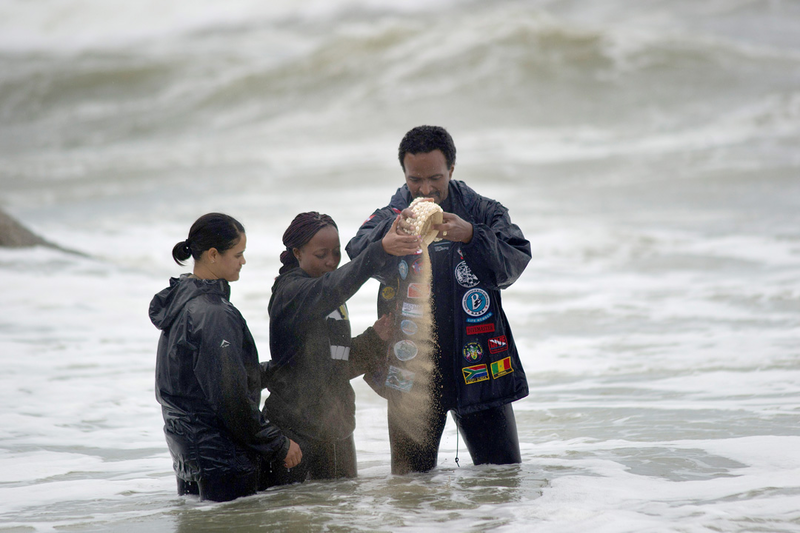 Bunch with bringing it to South Africa and depositing the soil at the site of the shipwreck during the memorial ceremony, in memory of his tribe's ancestors. "Please place it as close to the wreck as you can," the chief told the historian, "so that finally the souls of our people will rest in their own land." In Cape Town, hopes for good weather at the beachside memorial were met with a heavy storm and roiling sea. Winds blew along the shoreline and swept up menacing waves. "The sea was angry," Mr. Bunch says. "We understood what had happened in the water below us." There was poetry and prayer and reflection. Attendees spoke of the lives lost on the ship, but also of those who survived, for whom the wreck was merely a traumatic speed bump in a ghastly transaction. Finally, three divers—one each from the United States, South Africa and Mozambique—waded into the water. 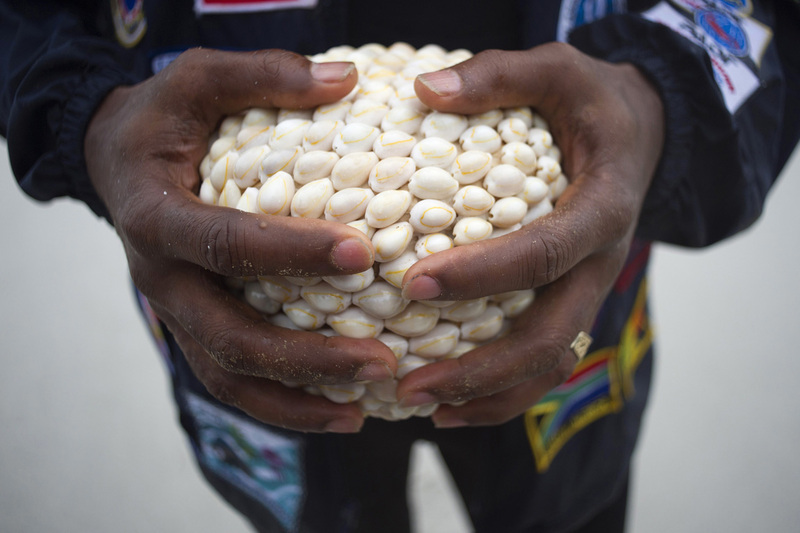 They poured the Mozambican soil into their hands and sprinkled it into the waves. Then, as if on cue, the rain subsided. The group stood, speechless, as the sun peeked out from behind black clouds.